Summary and Definition: The Pequot people were a fierce and powerful tribe of hunter-gathers and fishers who inhabited the southeastern coast of Connecticut from the Niantic river to Rhode Island, living along the Pequot (now Thames) and Mystic Rivers. The Pequot fiercely protected their territory and were extremely hostile to the European colonists. This led to the conflict known as the Pequot War (1634-1638) and the near annihilation of the tribe. What language did the Pequot tribe speak? The Pequot tribe spoke in a related dialect of the Algonquian language family. The meaning of the name 'Pequot' is derived from the Algonquin word "pekawatawog or pequttoog" meaning "Destroyers", reflecting their ferocious reputation. The Pequot tribe were originally part of the Mohican (Mohegan) people from the upper Hudson River Valley in New York near Lake Champlain. During the early 1500's the people moved to the Thames River Valley in southeastern Connecticut and later split into two tribes, the Mohican and the Pequot. 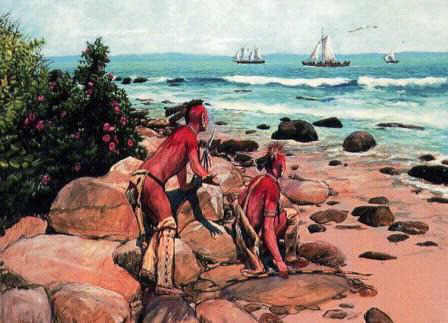 The Pequot tribe established their territory closer to the Connecticut coast. What was the lifestyle and culture of the Pequot tribe? The Pequot raised crops of beans, corn and squash and were great fishermen. The Pequot were a powerful, highly organized tribe who lived in heavily fortified villages of longhouses or in temporary shelters of wigwams during the summer hunting season. The tribe had a strong political structure led by a grand sachem and the tribal council. The elders of the tribe were held in honor and took part in decision-making. The warlike Pequot were bitterly hostile to the early settlers and also to their other great enemies, the Narragansett tribe. The hostility erupted into the violent conflict known as the Pequot War (1634-1638) that included the Mystic Massacre when nearly 700 Pequot men, women and children died terrible deaths. The Pequot War ended in defeat for the Pequot and the Treaty of Hartford on September 21, 1638 saw the Mohican and Narragansett tribes given their lands. The surviving Pequot were only able to find limited refuge with any other tribes and many were executed or sold as slaves to the West Indies. In the present day there are two small independent Pequot tribal nations in Connecticut, the Eastern Pequot Tribal Nation and the Mashantucket Pequot. Where did the Pequot tribe live? The Pequot are people of the Northeast Woodland Native American cultural group. The geography of the region in which they lived dictated the lifestyle and culture of the Pequot tribe. What did the Pequot tribe live in? The Pequot tribe lived in fortified villages of multi-family residences of longhouses in the winter, that were surrounded by strong palisades (fencing). In the summer when they went on hunting expeditions they built a temporary domed or pyramid shaped shelter called a wigwam or wetu. The wigwam or wetu was built with wooden frames that were covered with woven mats, sheets of birchbark and animal skins. Ropes were wrapped around the wigwam or wetu to hold the birch bark in place. What food did the Pequot tribe eat? The food that the Pequot tribe ate included the 'three sisters' crops of corn, beans and squash. All crops were planted, cultivated and harvested by women with the help of their children. The only exception was tobacco, which was tended by men. Fish such as sturgeon, pike and a variety of shellfish such as oysters, clams, lobsters and scallops were caught by these expert fishers. Hunters provided meat from deer (venison), moose, black bear and smaller game like squirrels and rabbits. Duck, wild turkey and grouse also added to their food supply. The Pequot food also included vegetables, nuts, mushrooms and fruits (blueberries, plums, strawberries and raspberries). What weapons did the Pequot use? The weapons used by the Pequot warriors included war clubs, tomahawks, battle hammers, axes, knives, bows and arrows. Their enemies were the Narragansett tribe. What clothes did the Pequot wear? Before the Europeans traded cloth with the Native American Indians the vast majority of the simple clothing worn by the Pequot people were made from animal skins or birchbark. The animal skins used to make their clothes included deer (buckskin) raccoon, beaver, otter and moose. The clothes of the men included long breechclouts, leggings, long cloaks and shorter shoulder to waist length mantles. Pequot women wore wraparound skirts, tunics and cloaks in the winter. Their moccasins were made of one piece of hide with a high collar that could be left up or folded down. They decorated their bodies with paint and piercings and wore various ornaments and jewellery. Specially valued was �wampum�, finely crafted shell beads, used as a form of currency. The men wore Roach headdresses made of porcupine hair, the tail hair of the white-tail deer or moose hair, that was often dyed a bright red color. The headdress was attached to a scalp-lock and stood straight up from the head like a tuft or crest. Sometimes feathers were added as decorations. Pequot History: What happened to the Pequot tribe? The following Pequot history timeline details facts, dates and famous landmarks of the people. The Pequot timeline explains what happened to the people of their tribe.